My favorite anything - book, movie, memory, story told over drinks - revolves around the search for oneself through a place-based journey. Give me a vista of open road on the screen, and you have me. Begin your narrative with a quest for home, in all its definitions, and I am yours. I believe in the power of places, the thread of history that channels us into what's next, and the kind of roots that grow because of our choices rather than where we were born. Some of this is why I stumbled into the field of planning the way that I did. I was writing about the power of place and feeling increasingly powerless in how such places are shaped. The fact that I now help shape places and miss simply writing about them is something you can take or leave in this discussion. One of my favorite books about the quest for oneself on the open road is Blue Highways, one man's rambling journey over state highways that begins as a search for answers on the day he loses his job and is left by his wife. Traveling these small roads, our hero sees America on the cusp of change, in the moment before far too many of the diners, Main Streets, fishing docks, and farms he visits are ravaged by Wal-Marts and condominiums. The trajectory of one man's life turning itself over along with the American landscape is poignant, achingly funny, and true. The Cornbread Nation series takes up my love for place-based narrative, and does so through the stomach. We accept rival brothers and their competing barbecue sauce brands as a metaphor for modern race relations in the South. We marvel at poetry that cuts to the heart of ancestral traditions through smoke and fire. We see direct linkages to Africa through the humblest and proudest pots of greens. In these essays, food is elevated to the common language and living history that it should always be. I'm thinking about Blue Highways and Cornbread Nation today because two friends are going through their own placed-based journeys, and they're doing so in ways that allow us to tag along. 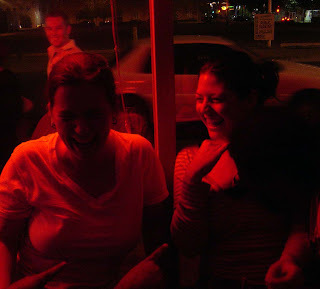 First, my friend Jessie has written a beautiful post about leaving New Mexico in two months and moving back to Asheville, NC, after a decade away from the mountains and hills and streams of her youth. As you know, I left New Mexico, too. As you know, I still carry it around with me everywhere, and always will. Knowing Jessie, I know how the eastern mountains have called her home, even as she's made an indelible mark on the high desert mountains of the West. I know what a big move this is for her, and I'm as thrilled for her as I am full of support for what will be a truly bittersweet departure. Is there anything tougher than leaving a place you love, even if it's to go to a place your heart knows you need to be? I'm not sure, but I'm so happy for her that she's following her heart across I-40. The second journey that's speaking to me these days comes from T's stepbrother Joe, whom you've met in my tales of Prague. (I wasn't lying when I told you I'd be recounting our trip sporadically, as you've noticed... the rest - the beer! - will come in time. Maybe soon-ish, now that I think about it.) Upon his stateside return after the family wedding, Joe took off on a meandering American tour to figure out, among other trivial matters, what he wants to do next with his life, and where he wants to do it. This sort of journey naturally puts everything he's doing right now at the top of my personal Stepbrother Gold highlight reel, it's so my kinda thing. Joe's been writing letters from his travels, and I think you should all read them. They're funny and perceptive and smart and they make me hungry. Go savor Barbecued Love Letters... you won't be sorry. Off I go... back to work shaping places. Or wishing I was just writing them, as it were. Love this post-I totally NEEDED to read this right now. I can't wait to head out on my own place based journey. I love your thoughts here; I feel like our journeys "home" (wherever that may be, and in whatever it means) say a lot about who we are as individuals. Another book you might like is Travels with Charley by John Steinbeck. I read it last summer, and ever since, I've had this desire to drop everything and drive across country. I think I'd probably learn more in my travels than I learn sitting at a desk all day! Oh I couldn't agree with you more. I love travel writing too - Paul Theroux, V.S Naipaul at a fairly meta- level. This is a wonderful post...so beautifull writeen and so poignantly dead on. Place marks the here and now of today, yesterday and tomorrow. It is our guidepost and the supporting actor in all of our stories. Right now I am struggling with my own place based journey...but in the form of a big fat question mark. Am I in the right place? Physically? Emotionally? I have felt my southern roots tugging at me stronger than ever before , yet I'm not sure how or when or even IF I'll ever get back there...anyway, wonderful post. Hope you are doing well!